Pakistan is a beautiful holiday destination. 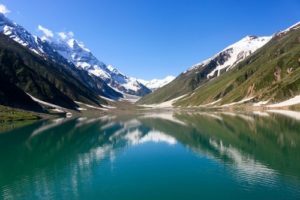 The high mountains of the Himalayas, the breathtaking beaches bordered by the Arabian Sea and the impressive landscapes of the Thar Desert make Pakistan a unique destination. If you are a trekking enthusiast, you will be won over by the mountainous regions in Pakistan. The ancient civilizations of the Indus, the Gandhara kingdom and the Mughal empires have all made their mark on the country, and will undoubtedly impress art and history lovers. Adventurers can participate in camel safari days in the Cholistan desert, which is the best way to experience Pakistan’s nomadic lifestyle. Although difficult, finding a health facility in Pakistan is not impossible. Karachi is home to the Aga Khan University Hospital. If travelling with children, the Children’s Hospital at the Pakistan Institute of Medical Sciences offers emergency pediatric treatments. If you seek medication, try not to rely on the advice of a pharmacist as they are often insufficiently trained. Drugs sold in pharmacies are not produced in Pakistan, but by major pharmaceutical companies. In the event of an emergency, the best option is to drive the patient in a private care to a nearby health facility. Nonetheless, for medical assistance you can dial 115 or 1122. Is Pakistan Safe for Travel? Do I Need a Visa to Visit Pakistan? Both, a visa and a passport are required to enter Pakistan. The passport must be valid for at least 6 months beyond the date of departure. A proof of immunization against polio may be required.